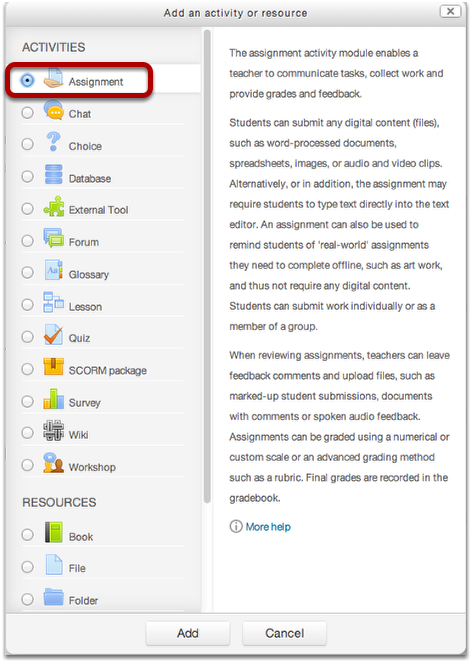 VeriCite DocumentationUser GuidesMoodle User Guide Instructor ArticlesHow do I add a VeriCite assignment? VeriCite is a plagiarism detection service which is integrated with Moodle assignments. Instructors can add VeriCite plagiarism checking to any assignment created within the Assignment area by following the steps below. Add an Assignment from the Activities menu in your site. Create the assignment as usual. If VeriCite is enabled in your instance of Moodle, you will see VeriCite options in the assignment settings. 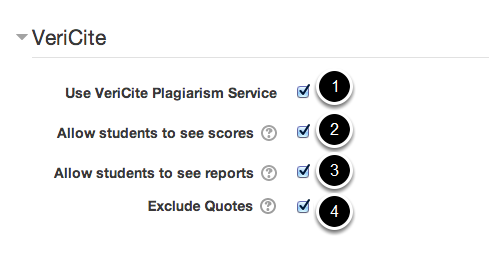 Check the box next to Allow students to see scores if you want students to see their own plagiarism scores. Check the box next to Allow students to see reports if you want students to see their own reports. Check the box next to Exclude Quotes to set the default for this assignment to exclude quoted material from the report. It is recommended that you enable this option as the default to avoid false positives. You will still be able to toggle between excluding and including quotes within individual reports. Click either Save and return to course or Save and display to save your assignment settings.